Hello, friends! I hope you are enjoying your Friday! Yes, the wedding was awesome! Matthew and I were surrounded in a cocoon of love from each other and family and friends and it was probably one of the funnest days of my life. Yes, the honeymoon was amazing! Five nights in Disney, seven nights on a Disney Cruise, and one last night in the World was the most perfect start to our marriage. I promise to write tons more posts in the next few weeks including Pittsburgh Marathon Weekend recaps and a review of our fourth Disney Cruise on the Disney Fantasy- our first time on that ship. In the meantime, I am excited to review a fun product today- CozyPhones! The folks at CozyPhones reached out to me a few weeks ago and sent me a set of their active/lycra headband headphones to review. The headphones came with a black storage bag and an index card with fitting instructions. I was super pumped to try these out for a few reasons: 1. I have seen some similar products on the market but was skeptical of how well they would work so I hadn't bought any. 2. Even though I LOVE my Yurbuds for running, when I've been wearing them (or really any "in-your-ear" type of headphones for more than two hours, my ears start to hurt. As you know, I'm a back-of-the-pack runner so my long runs are frequently longer than two hours so I frequently have ear pain after long runs. 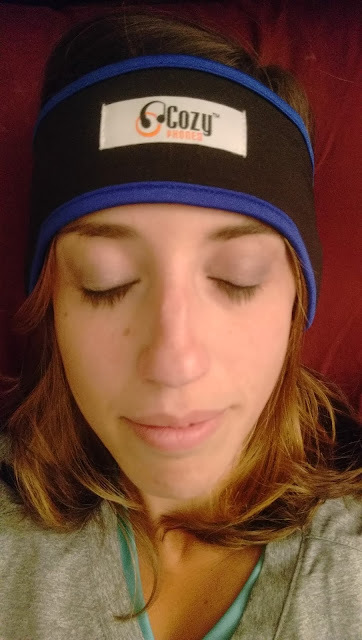 I've used CozyPhones for several activities- running, weight lifting, and to help me fall asleep at night while listening to guided meditation on YouTube :-) Overall, they are pretty cool for a number of reasons, some of which I've highlighted below. These are really nicely made. 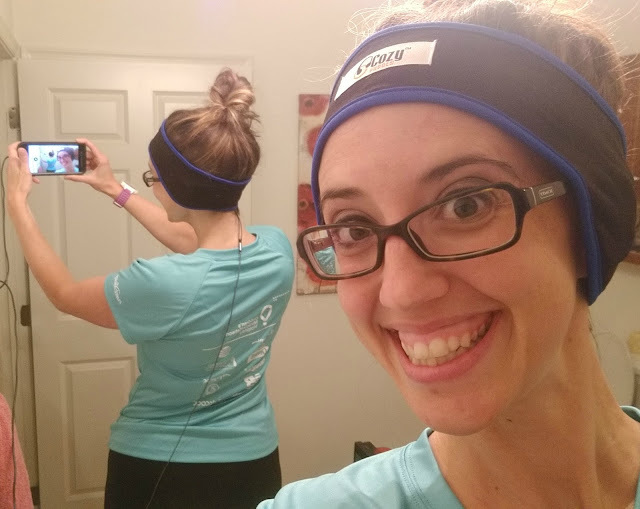 They headband is super soft and stretchy and quite comfortable. The headphones are advertised as "non-tangle" and that is 100% accurate! The headphone cord is braided and doesn't "cling" to itself the way many other headphone cords do. Surprisingly, these headphones have decent sound quality. They are not as great as the Yurbuds I normally wear but I actually think I may prefer the Cozy Phones for outdoor running because you can still hear what's going on around you as you enjoy your playlist. In other words, they don't block out all other sound the way most headphones do. I think these are a bit safer than a traditional headphone for outdoor/road running. In addition, though it looks like these headphones would "leak" sound, they totally didn't. I put them on, turned the volume up, and sat right next to Matthew- he couldn't hear a thing! I really, really liked how the headphone cord ran down the back of the headband. It was really nice to work out without having to tuck the extra cord in my sports bra, LOL :-) Also, the actual headphones are these soft little disks that are adjustable within the headband. These were super comfortable for sleeping as I could lay on my side and not feel the headphones at all- not something you can do with traditional headphones. These felt a bit loose to me. I would have preferred a tighter fit so the actual headphones were closer to my ear. While they didn't slip much while working out, I'm not sure how well they would stay where they are supposed to during a long run. The headphone-disks inside the headband are easy to adjust but that also means that they have a tendency to move around while in use. This may be because the headband was a little loose but I'm not 100% sure. Right now, for summer running, these aren't very practical. It's too hot to wear anything on your ears/head. However, I think these could be really awesome for fall/winter weather- they would act as two things in one: an ear warmer and a pair of headphones. Overall, these are a cool product that I'm happy to add into my rotation of running stuff. To be honest, my favorite use of these headphones has been to help fall asleep at night. One of the most important (and often most neglected) factors of marathon training is getting quality sleep. I like to use guided meditation or other ambient noise (via YouTube) to help fall asleep and these headphones make it easier and more comfortable to do that. What kind of headphones do you use for running, working out, sleeping, etc? Have you ever used headphones to help you sleep? 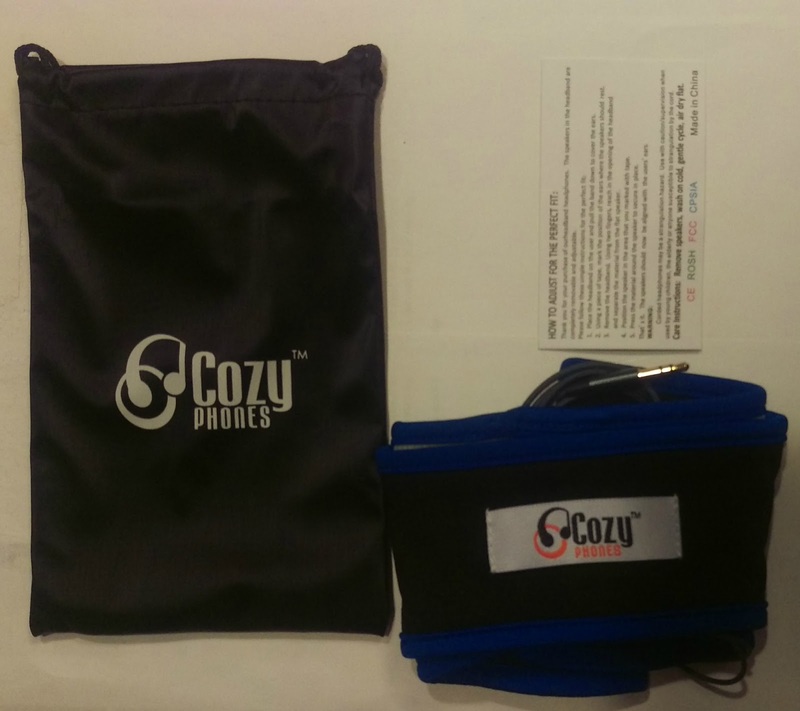 Disclaimer: CozyPhones provided me with a set of headphones to review on this blog. I did not receive compensation in exchange for this review. As always, all opinions are on my own. Glad to hear you had such a great time! Congratulations! I only use my headphones for workouts, and I use the earbuds that came with my ipods and iphones. They're fine. I haven't seen the need to spend more money to keep trying new ones.